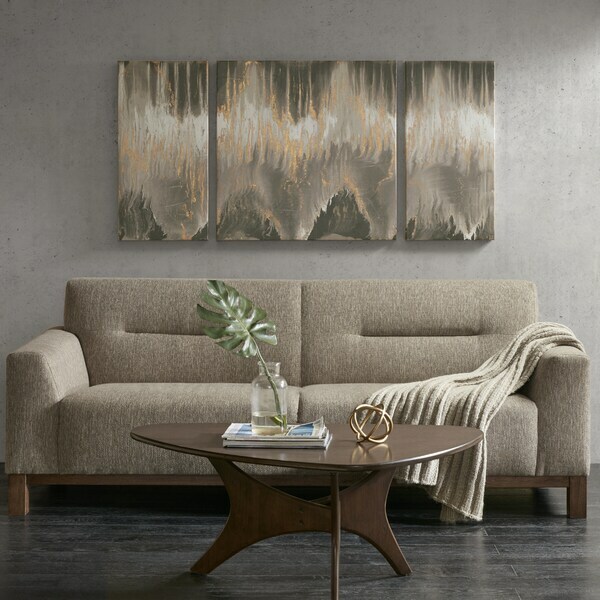 This piece is absolutely beautiful and its large so great for behind a couch or a large wall that needs a little something. It is canvas but it does not look like a cheap canvas. You can see and feel the details of the painting. 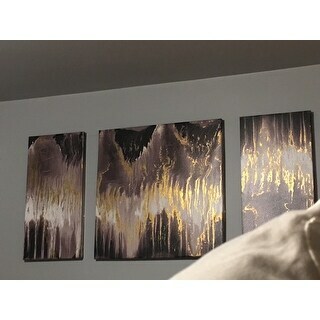 It is three separate pieces so it was a little difficult for an amateur like myself to hang so I would recommend having a helper. But for the price, this piece is amazing!! This 3-piece canvas set provides strikingly bold look to your home decor. This modern canvas set flaunts vivid black and sand hues that are accentuated with gold foil embellishments, for a touch of elegance. The gel coating protects the colors from fading, while a cardboard backing provides additional structure and support. Incorporate this daring three piece canvas wall art set into your living room or bedroom to make a bold statement. An ok set for the price. Colors are not as nice as shown in the pictures so I returned the set. More black than charcoal as shown on my phone and desktop. Overstock return shipping is expensive if you decide to return.